Don Pettis remembers a time when his hometown of Conover, North Carolina, was the furniture making capital of the world. However, now, much of the furniture has gone the way of so many other manufactured products - to Asia. Mr. Pettis is the co-owner of Tradewinds International Inc., a small lumber distributor and wholesaler that has been in business for almost 30 years. The company concentrates on specialty high grade woods destined for the window, door, flooring, staircase and molding markets. In addition to sitting in what was once the furniture capital of the world, the company provides jobs in a place that has had high level of unemployment since the recession. 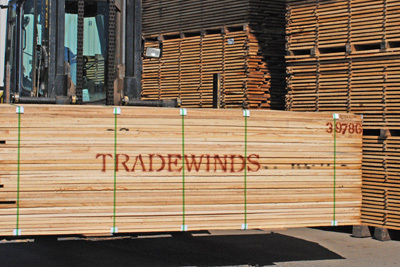 Tradewinds International is just one of hundreds of small and medium-sized businesses that rely on EXIM Bank to compete abroad while keeping about 1.2 million jobs in the U.S. Mr. Pettis’s company exports up to 95% of its lumber overseas, mainly to Europe, the Middle East and the Far East. Of those sales, Tradewinds relies on EXIM Bank to assist in just 5% of its transactions, but for a small business that makes a big difference. The recent years have been marked by intense competition that led Tradewinds International to begin using EXIM for receivable insurance. Many of the company’s sales wouldn’t have been made otherwise as the insurance allows the company to extend credit to its buyers while being protected against nonpayment. EXIM has supported $1.6 million of Tradewind's exports during the 2013 to 2018 period.